I've been enjoying my new grilling setup and trying to incorporate it into lots of new dinner ideas. I am working on a whole youtube series about this that should be coming as early as next week! Yesterday I was craving drunken noodles and I realized I could use the grill to mimic some of the wok charred flavors you expect in that classic Thai dish. To make it more of a mash-up I added bbq sauce to the drunken sauce. I loved how this came out and it really felt like a blending of the Thai flavors with a backyard BBQ. Fish sauce, rice vinegar, light and dark soy sauces, ginger, garlic, chile oil, and bbq sauce. Toss the cooked noodles with the sauce. Meanwhile grill everything else. The chicken was marinated with fish sauce, rice vinegar, and sugar. All the flavors in this went so well together! I used regular corn since it often comes with baby corn and it went well with the BBQ theme. The charred onions really made the dish, and not mixing everything together was a good move because you could grab as many peppers as you wanted for your desired heat level. A flavorful weeknight dinner that wasn't hard to pull together and satisfied my takeout cravings. Mix the chicken with the fish sauce, chili oil, sugar, vinegar, garlic, ginger, salt, and pepper. Allow to marinade for at least 1 hour. Mix the fish sauce, chili oil, soy sauces, bbq sauce, garlic, ginger, and rice vinegar in a pan and bring to a simmer. Remove from heat. Cook the rice noodles according to the package. Strain and rinse with cold water. Add to a bowl and stir in the sauce. Grill the chicken until browned and cooked through, about 20 minutes. While the chicken is cooking, brush the other veggies with oil and salt and brown on the grill. 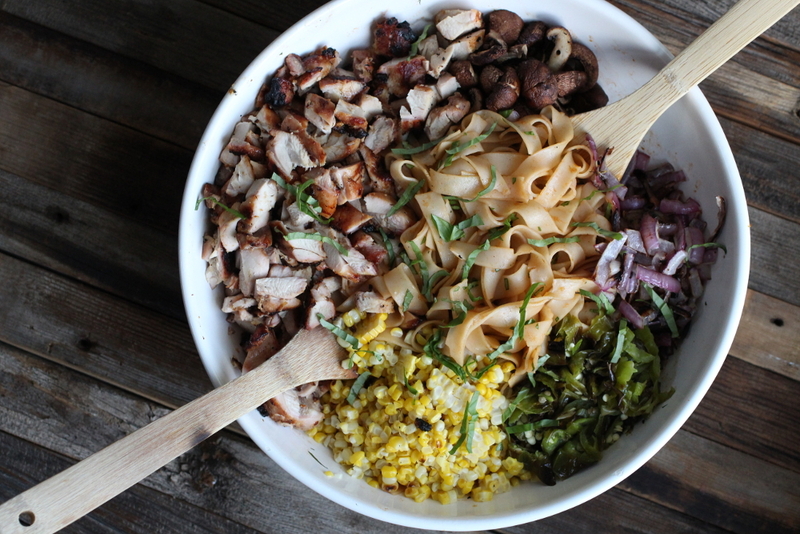 Chop the veggies and chicken and add to the bowl with the noodles. Top with basil and serve.